Regardless of where you play (on-road or off), the first thing you need to do is get in the game. 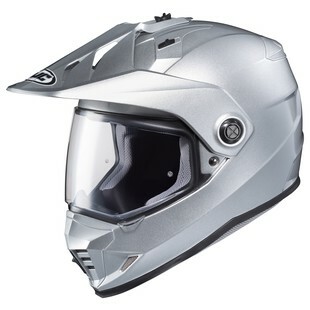 With HJC introducing helmets like the new DS-X1, they have effectively lowered one of the barriers to entry for quality Dual Sport riding by offering a high-value, entry-level DS helmet. The HJC DS-X1 Helmet uses an advanced polycarb compact shell and offers a comfortable fitment that was designed using CAD technology. Internally, the DS-X1 is equipped with a SuperCool moisture-wicking liner that is anti-bacterial, removable, and washable (thus keeping the funk out!). Additional features of the new DX-X1 Helmet include a large, goggle-accommodating eyeport, Advanced Channeling Ventilation for maximum airflow, and specially-cut slots for increased comfort while wearing glasses. Riding off road is fun. Riding on road is fun. Spending a small fortune on a helmet to get you there is not. With the new HJC DS-X1 riders can skip the latter, while making the most of the former.